Out in the west there are many wonderful walks down to and beside the sea. One such is the rich river valley of Boca do Rio, west of Lagos. This walk offers untold riches to the observant, from the flowering of the Paper-white Narcissus at Christimastime, continuing through the following spring and into summer there is always something of interest to see. The valley's proximity to the coast means that it can be a magnet for many species of birds travelling back and forth during migration. Sadly, the beach has been somewhat spoiled as a result of being adopted by campervan owners as an unofficial campsite, but the beauty and wildlife of the rest of the valley remains reasonably intact, at least for the time being. The valley lies between the unspoilt fishing village of Salema on the western side, and Burgau to the east. In recent years the roads between the two villages have been improved, mainly due to an extravagant new development of villas on the top of the cliffs on the Burgau side which remain largely unoccupied or abandoned. Regrettably the road on the Burgau side was built over outstandingly good colonies of the Man Orchid, Orchis anthropophora, which have yet to reappear in the surrounding land. Despite this, the area remains one of the best places to see a whole host of the wonderful orchid species that grow in the Algarve along with many of the other iconic wildflowers such as the Yellow Hoop Petticoat Daffodil, Narcissus bulbocodium, Paperwhite Narcissus, Narcissus papyraceus, and the gorgeous Sea Daffodil, Pancratium maritimum, which grows to the rear of the beach. With the exception of the Sea Daffodil, which blooms in July, the ideal time to visit if you want to see many of the wildflowers is spring. Late evening or early morning are the best times to look out for the mammal species that are reported from the area, and both spring and autumn are good times for seeing many of the resident birds of the valley as well as those that stop off there on their spring and autumn migrations. The turn towards Boca do Rio is clearly signed. 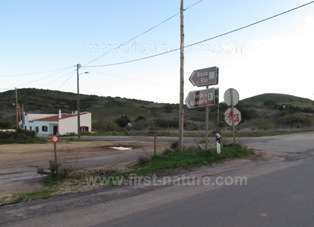 When travelling west towards Cape St. Vincent you will see the turning on the left-hand side of the main N125 road between Budens and Figueria. Alternatively you can follow the coast road between Salema and Burgau, which will take you through the valley. There are cafes and shops in Salema and Burgau. Roads have now replaced some of the old tracks in the valley. There is a cycle path leading inland from the bottom of the valley on the Burgau side, and this also provides a good level walk along the river. Otherwise the tracks are steep and rough, and the area beside the stream can be waterlogged and very boggy underfoot after heavy rain. The valley at Boca do Rio is home to a number of the elusive mammals of the Algarve, although the casual daytime visitor is unlikely to be lucky enough to catch sight of any of them. The hours of darkness are when these shy creatures venture out to hunt, and Badgers, Gennets and Egyptian Mongoose have all been reported in recent years. 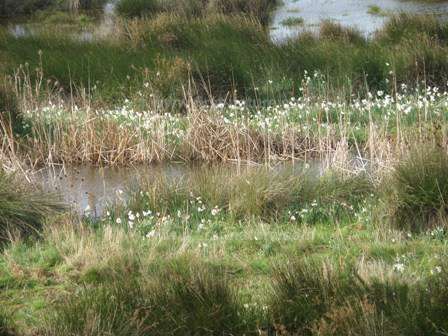 The river is also home to Otters, and in the wooded inland area behind the valley evidence of Wild Boar is easy to spot. Although wet, the quality of the soil in the valley close to the beach is poor and is mainly used to graze cattle and goats. The grazing regime is sympathetic to many of the wildflower species because it keeps rank growth and shrub invasion to a minimum, allowing more delicate species to thrive without suffocating competition. From December through until March the banks of the river are dominated by magnificent displays of the beautiful Paperwhite Narcissus. Although it is picked by some people, this is not a good cut flower and the smell, once confined to the indoors, is overwhelmingly unpleasant. Like many of our precious wildflowers it is best left alone so that others can enjoy it in the wild. Other early flowers that appear in Boca do Rio include the Yellow Hoop Petticoat Daffodil, which occurs mainly on the steep slopes at either side of the valley. As spring progresses many of the wild orchid species appear: Mirror Orchid, Ophrys speculum, and its unusual close relative Ophrys lusitanica both grow along the cycle track that leads inland from the bottom of the valley. The sides of this track are also home to the Bee Orchid, Ophrys apifera, Sawfly Orchid, Ophrys tenthredinfera, and from time to time Green-winged Orchids, Anacamptis morio. The latter grow on the grassy slopes beside the cycle track, but the plants are often submerged by landslips which are fairly common here during and after heavy rainfall. Although many of the Man Orchids, Orchis anthrophora, have now been buried under tarmac, it is worth looking out for new colonies that may appear in due course. 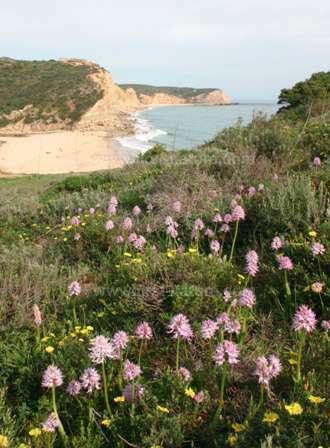 At the top of the steep banks and behind the villa development on the Burgau side of the valley, at the end of April and well into May there are vast displays of Pyramidal Orchids, Anacamptis pyramidalis. They are kept company by many other wildflowers including Blue Hound's-tongue, Cynoglossum creticum, Allium paniculatum, Wild Clary, Salvia verbenaca, as well as numerous thistles and various members of the Pea family, Fabaceae. In the damp ground close to the river, Button Weed, Cotula coronopifolia, and Water Crowfoot can be seen in bloom in the early spring. This more westerly part of the coast of the Algarve is a mecca for bird watchers, and although the Sagres Peninsula (further out to the west) is the 'Holy Grail' for those hoping to spot rare species during the autumn and spring migrations, the area around Salema and Boca do Rio gets its fair share of winged-wonders that we can enjoy. Booted Eagles, Griffon and Egyptian Vultures and Black and White Storks all stick close to the coast during their journeys, and in bad weather many will stop off and take a break before moving on. Black-eared Wheatears, Golden Orioles and Nightingales are also recorded from this part of the Algarve. We often see Azure-winged Magpies on our walks in Boca do Rio, and there is the constant noise of the Stonechats to accompany us; they perch on reeds temptingly close and wait until you have just focused the camera before flying off, leaving you with an excellent image of where a Stonechat used to be!